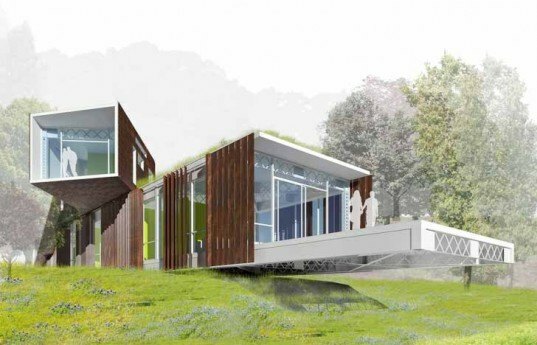 The winners of the international student Bay Bridge House Design Competition were just announced, and we're happy to report many of them incorporated recycled materials into their designs. Students were asked to come up with fresh ideas for eco-friendly residences and multi-use spaces that will preserve the memory of the soon-to-be-dismantled eastern span of the Bay Bridge in San Francisco. 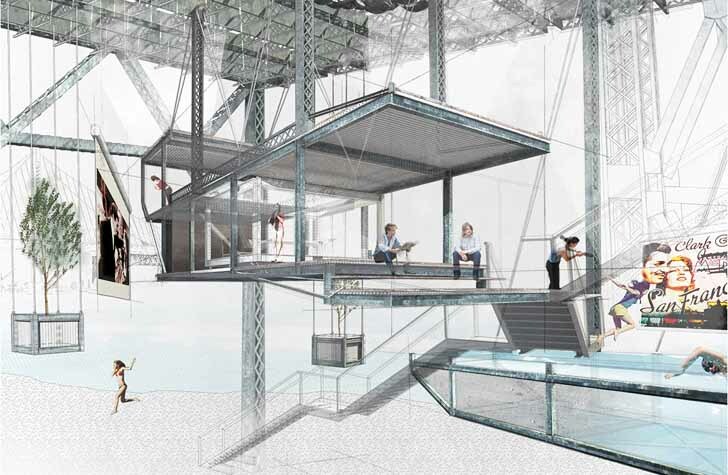 They responded with a host of innovative ideas, including the winning Hanging House that incorporates scraps from the demolished bridge into an inspired design. The competition attracted 73 entries from 37 international and US-based architecture schools. The submissions were narrowed down to 14 designs that were then judged by the Board Members of the Bay Bridge House, community voting and industry expert judges. The trophy for the winning entry was made from a now demolished S curve taken from the Oakland Bay Bridge. Lee Ka Chun and Ngan Ching Ying won the first prize with their “Hanging House” proposal. They designed a self-sufficient house that would be built out of scrap material from the demolished bridge. Board Members chose Qazi Shamsud Tamzeed from Bangladesh for his entry ‘An Invisible Triangle,” which incorporated half of the span of the bridge’s deck truss as the structure for the residence. French student Romain Caba won the Community Vote Award. He filled the large beams that currently carry the road with insulation and transformed them into thermal barriers, while the trusses would constitute the structure of the house. Honorable mentions went to Chris Bennett’s “Reclaimed Lookout,” as well as Katerina Krupickova and Gabriela Kralova for their “Pier House” proposal. French student Romain Caba won the Community Vote Award. All of the top students incorporated some kind of recycled materials into their designs. They designed a self-sufficient house that would be built out of scrap material from the demolished bridge. Board Members winner was Qazi Shamsud Tamzeed from Bangladesh with his entry ‘An Invisible Triangle”. Honorable mentions went to Chris Bennett’s “Reclaimed Lookout”. More honorable mentions went to Katerina Krupickova and Gabriela Kralova for their “Pier House” proposal.